Sometimes you’re just craving pasta… Even at 10:47 in the morning. Appropriate? Maybe. Perhaps that’s why I love brunch so much. Got some vodka? Add some juice, and magically daydrinking is now encouraged. Take your favorite thing to eat at dinner, throw an egg on it, and VOILA! It’s now acceptable to eat it before noon. Some of my favorite brunchie things are any type of steak and eggs (I had a chimichurri flank steak and eggs at Dexter’s Winter Park that was amazing) and crab cakes eggs bennedict (the gold standard of this is at HUE in Thornton Park, but I heard they are now closed, which may be good because I can only justify paying $14 for this dish there). Sadly I don’t keep crab cakes on hand. So I rummaged around in my fridge once I finally put my book down, because sleeping in and reading a good book in bed is quickly taking precedent over cardio tennis at 9 in the morning. I do fancy myself a Kitchen MacGyver and I love a good challenge. Kinda feels like Iron Chef, and today’s secret ingredient was the leftover whole wheat penne I’ve had shoved in the back of the fridge since making the conscious decision to slow way, way down on the amount of bread and pasta that I eat. This decision was also made before my friends and I decided to make homemade pizzas nearly every other day for a week, which explained the open jar of pizza sauce sitting in the fridge amongst all of the lovely fruits and veggies I just bought and have barely touched. I blame it on all of the work functions, the awesome friends that I have that just love to share great food in unorthodox abundance, and this new beau of mine that enjoys treating this lady to culinary adventures around town. It’s not entirely my fault. But since I turned down the urges to order pizza and wings at midnight and opted for a good night’s sleep, I will indulge in a little pasta this morning. Topped with eggs, of course. 1. Get a pot of water to a rolling boil, salt it, and drop in your pasta. Cook it like usual, for about 7 minutes or until al dente. 2. While your pasta is cooking, get a frying pan, preferably a deep one, and fill it about half way with some water and a good splash of your vinegar of choice. If you need definition of a ‘good splash’, take that as 3-4 tablespoons. Bring this to a soft simmer. 3. 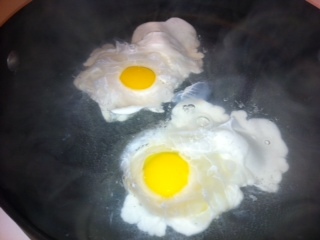 Once the water in the pan is lightly bubbling, crack your eggs and slowly add them into the water. This is called poaching. The vinegar in the water and the temperature will keep the whites from making a huge mess. After about 2 minutes, you can take a slotted spoon and gently turn them over in their bath. If you like runny yolks like me, take them out of the water after another 2 minutes and place them on a paper towel to drain. For fully cooked yolks, go for a full 3 minutes. 4. After the pasta is done, drain it, add it back to the pot, and throw in your handful of spinach. Wilt the spinach, which won’t take too long because of the heat of the pasta. Toss in a few spoonfuls of your tomato sauce to coat the pasta and heat through. 5. 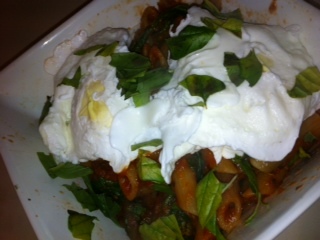 Put the pasta and spinach into a bowl, then top with your poached eggs. I added a chiffonade of fresh basil and some pepper, but you could also throw on a little grated Italian cheese or a drizzle of quality olive oil. 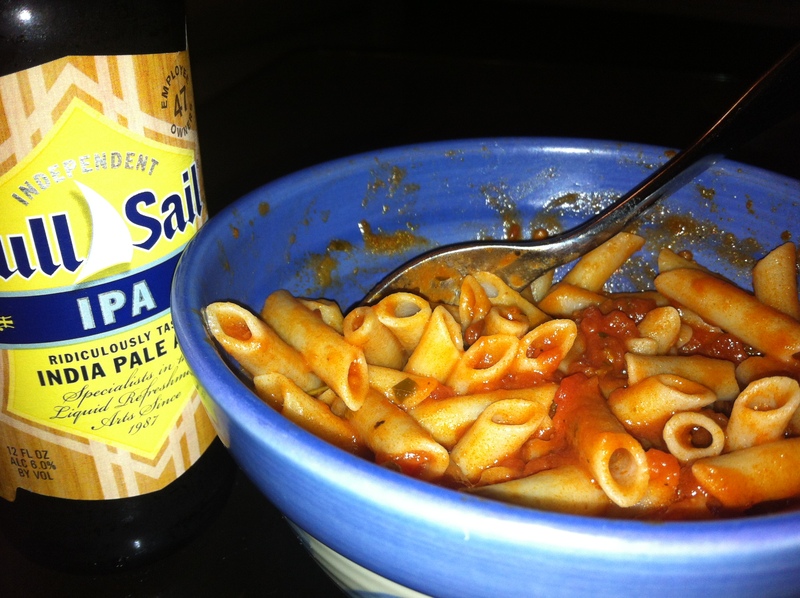 Lazy dinner… Rice penne with Rao’s Homemade marinara sauce and, of course, beer. Some times we just don’t feel like cooking. Usually I buy the typical BOGO jarred sauce from the supermarket, let it sit on the shelf, and by the time I open the jar it will go bad before I even finish it. Not the case with Rao’s. I bought it after my fellow foodie Kayla Rose justified the $6.99 (on sale) price tag. So one night after the gym I needed to make a quick and easy dinner and gave it a shot. Just smelling the sauce hitting the hot pasta was enough to do me in. There was such a freshness to the tomatoes despite it being a jarred sauces, and the flavors were so intense. I knew this was a winner when I threw away the empty container. This week it was on sale again, and I actually had to resist the urge not to buy 2!